Methods to Make Chlorine Solution in Ebola Emergencies, 2014. Chlorine solution is widely used for disinfection in emergency response activities. In Ebola response,0.5%chlorine solution is recommended for cleaning non-­living things and surfaces and 0.05% chlorine solution is recommended for cleaning living things. The methods for on-­site manufacturing include: 1) dilution of HTH or NaDCC powder in water; 2) dilution of concentrated liquid solution in water; and, 3) generating sodium hypochlorite using salt,water,and electricity. Anna Indeed rain may contain chlicmaes like mercury, pesticides, and nitrates but in the case of flooding rainwater will move large amounts of organic debris. These may contain anything that is lying on the surface of the land including dirt, feces, and bacteria. 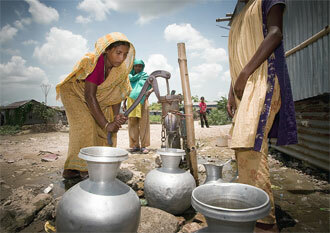 Therefore a well can become contaminated in potentially harmful ways. After a flood a well water test can be used to determine if the well is safe to drink or if it requires some type of .